Developed by Indian Institute of Technology alumni, the EyeROV TUNA becomes the country’s first underwater drone viable for commercial usage. With remote accessibility and HD video imagery, the drone opens up a wide range of operations in rescue, defence and research. 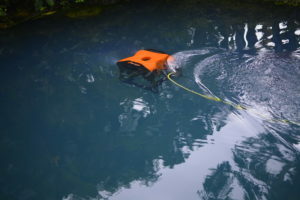 History was made at Maker Village in Kochi, as EyeROV Technologies, a locally based company unveiled India’s first ever underwater robotic drone on September 15. The drone which had been named, EyeROV TUNA, is a remotely operated vehicle (ROV) equipped with cameras capable of generating HD video and imagery. Weighing at less than 10 kgs, the EyeROV has been designed to perform the submarine surveillance of underwater environment and natural structures. It can go down to a depth of 50–100 metres in “harsh and mission critical environment.” The micro ROV is very cheap when it comes to operational costs. The remote can be hardwired to easily available hardware including laptops, gamepads and joysticks. The camera attached to the drone is fitted with infrared lens. The drone moves at a cruising speed of two knots and is equipped with 6,000 lumens LED lamps and a 3+ hour battery life. The developers hope to open up a range of operations. Expected utilities include location scouting for search and rescue missions, surveillance for the defence sector and for research sectors. The fishery sector can use the device to track down schools of fish while it also allows for extensive underwater film-making. When compared to the underwater drones available on the international circuit, however, the TUNA falls short in a few categories. This includes the depth to which it can travel. While the average drone can travel down to 80 metres, models like the Blueye can go down to 150 metres while the CCROV and the OpenROV can go down to about 120 metres. Another issue is the weight, at just under 10 kgs, the TUNA is heavier than most other commercially available underwater drone with the average weight being within the range of five to six kgs. This poses a problem when the pressure mounts on the device in lower depths. EyeROV Technologies, which was mostly known for being India’s largest hardware incubator, have collaborated with Kerala Startup Mission in various stages of the development programme. The organisation have already received orders for the drone. The first order was made by NPOL–a Delhi based laboratory for Defence Research and Development Organisation (DRDO). NPOL director, Dr S. Kedarnath Shenoy received the first ROV from Dr Saji Gopinath, CEO Kerala Startup Mission during the launching ceremony on September 16.